Lynda Loigman and Renée Rosen in conversation with Andrea Peskind Katz addressing the roles of Jewish women during and just after WWII. 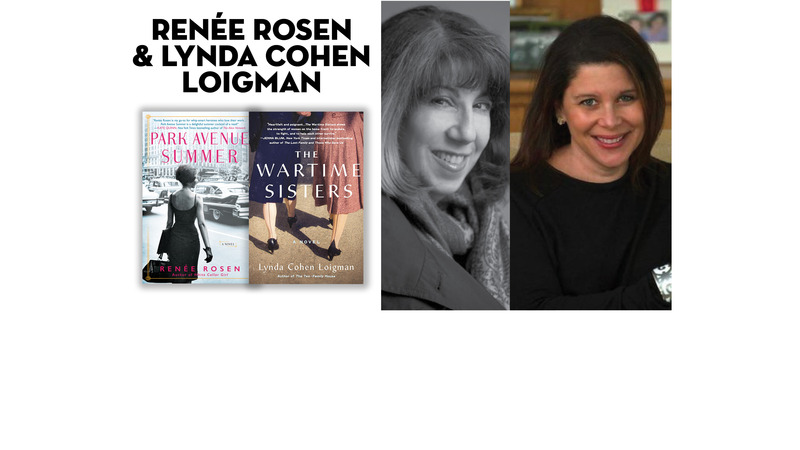 These subjects are addressed in Loigman’s The Wartime Sisters and Rosen’s Park Avenue Summer. It’s 1965 and Helen Gurley Brown has just taken on the impossible: reviving the venerable but fast-fading Cosmopolitan magazine. With the old guard at the magazine fighting her from the inside, Brown relies on her new assistant, Alice Weiss, to act as her eyes and ears, teaching the young woman along the way that intelligence, savvy, and an ironclad will can move mountains. Told from Alice’s perspective, Park Avenue Summer offers a window into HGB’s tumultuous efforts to reshape Cosmo into a magazine for “her girls.” Informed by author Renée Rosen’s extensive research—including interviews with Lois Cahall who considered HGB her second mother—the novel contains some irresistible details that only those closest to HGB would know: the way she ate salad with her fingers, one lettuce leaf at a time or the small chair she sat in during business meetings so she wouldn’t intimidate anyone. Renée Rosen is the bestselling author of Windy City Blues, White Collar Girl, What the Lady Wants, and Dollface. She is also the author of Every Crooked Pot, a YA novel published in 2007. Her newest novel, Park Avenue Summer, about Cosmopolitan’s iconic Editor-in-Chief, Helen Gurley Brown, will be published April 30, 2019 by Penguin Random House/Berkley. Renée lives in Chicago where she is at work on a new novel, The Social Graces, coming in 2020.